The Metronomicon: Slay The Dance Floor is such a good idea. Such a good idea. Merging rhythm game action with RPG character development is a marriage of mechanics that should have worked a treat for someone like me, who almost exclusively plays RPGs and rhythm games. And it does come close to being what I wanted, but the developers clearly struggled to give both those genres equal prominence in the end. 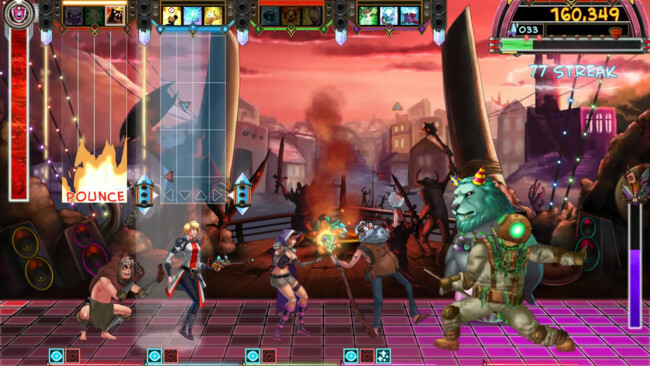 Metronomicon gives you control of a party of four heroes in battle, each of which has a certain role on the battlefield. One heals. Another acts as a brick wall and shield for the team. Another rains down death and destruction of the magical variety. Does this all sound familiar? It should, of course. It’s the basic premise of the RPG. The difference is how these attacks and abilities are enacted. In most RPGs, you’re selecting attacks from a simple menu. Move a cursor over to an option and press a button to have that attack play out. But not Metronomicon. Oh no. In Metronomicon, each character has a stream of icons that drop down from the heavens above their heads. Those icons appear in rhythm to the music backing track. To attack, you simply select a character from the four, and then chain together a number of these icons together by pressing the button they correspond to at the right moment, as they reach a line at the bottom of the play field. After a bar or two of doing this with good timing, you can enact an attack on the enemy, or other special ability that benefits the team (such as healing them), and that character’s icons will disappear for a period of time as they “recharge,” forcing you to either wait for a few seconds, or swap over to another character and start building icons towards a different attack or ability. At intervals, the enemy will launch attacks of their own, and a battle is failed if the team runs out of health, so it’s important to settle into a rhythm (ha) whereby you mix up dealing damage to the enemy with protecting the health of your own team. Characters will earn experience with completed levels, and over time will gain new skills and abilities, which gives you more strategic opportunities in combat. For example, if you opt to string together a lot of different icons, then you’ll be able to pull off ever more impressive attacks and abilities. 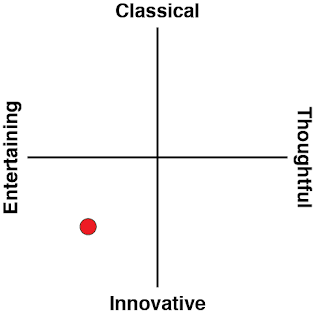 It’s a really intriguing system, and makes perfect sense within the first couple of tracks. It’s also far, far more strategic than I expected going in. I expected to be mashing buttons and powering through, but developing a keen understanding of when to swap between characters, and which attack to use where, is absolutely critical to success in Metronomicon, and it starts to feel like playing a musical instrument in practice, as you move back and forth between characters like frets on a guitar. There's a layering of rhytmic demands of the player (have good rhythm in pressing buttons to activate icons, and then have good rhythm in swapping between characters) which both demands skill and feels really good to master. These mechanics are undoubtedly the highlight of the Metronomicon experience. Thankfully the musical track list, filled with indie acts that you wouldn't necessarily have heard before but might just become a fan of afterwards, is also excellent, offering both variety and depth. Taken purely on its rhythm game credentials, Metronomicon really excels as something quirky and different. Unfortunately what lets things down is that narrative, and the RPG side of the equation. Put bluntly, there isn’t a narrative worth following. Bits and pieces of storytelling are thrown in at points, but these don’t amount to anything with any meaningful depth. Moving from one music track to the next plays out exactly as you would in any other rhythm game; you simply select the next track from a menu. Between battles there’s more menus to wade through in order to set up characters with their equipment for battle and so on, but there’s no room to actually explore, and very little in the world to interact with. Monsters pop up in battle, and they look great, but you’re not going to have the time to concentrate on them in battle, and with such limited lore behind them, the intriguing art seems has largely gone to waste. This is a fundamental issue with a lot of developers that mistake “RPG” for “stats, character levels and unlockable skills.” It’s not that. The RPG genre is about storytelling, and Metronomicon largely misses the mark with this. It’s not just that the storytelling is minimalist and that there’s such a limited sense of character and place that I didn’t find myself immersed within the world at all. It’s also that what thin narrative that is there aims for humour and much of that lands flat too, relying far too heavily on what can only be described as a mix of nerd humour and dad puns. The soundtrack is excellent, as mentioned before. For an indie team to wind up with a tracklist of that that depth is a real testament to the effort that’s gone into the project. The downside to having a soundtrack pulled from a wide range of different artists, however, is that the music doesn’t actually help with any attempts at narrative or world building, further isolating the “RPG” side of this melding of genres. 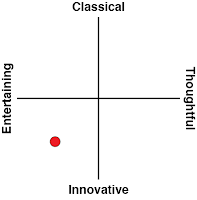 Just about any great RPG you can think of - the Final Fantasies, NieRs, and Personas of the world, rely heavily on the music soundtrack to help build narrative and world. Metronomicon's soundtrack wasn't made for the game, and therefore can't fill that role. Taken exclusively as a rhythm game, there is so much to appreciate about Metronomicon. It does bring some new tricks to a genre that often feels quite stale for ideas, and has a truly killer soundtrack. 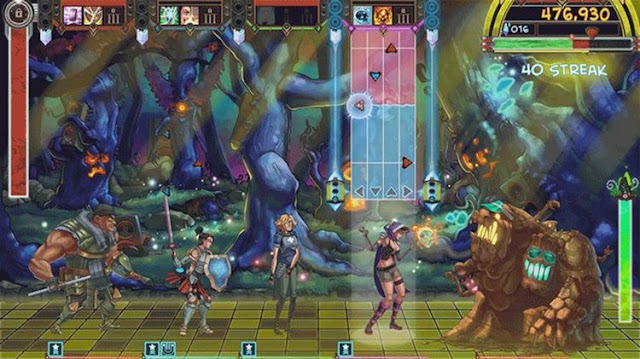 But, this was meant to be a mix of RPG and rhythm games, and Metronomicon did let me down with the former. An elegant skills and level up system doesn’t make an RPG, and in leaving the narrative and characterisation so thin, I was left feeling that the game was quite hollow. Which is a pity because if it hadn’t tried – if the game had have positioned itself as a quirky pure play rhythm game and done away with the RPG stuff entirely, I think I would have loved it.